1. A splurge-worthy salt and pepper shaker set you might think would belong in a modern art museum rather than on your kitchen counter. Get the set of two from Amazon for $74.95+ (available in seven colors). 2. A floral pot holder to help your cooking really ~bloom~. And if it doesn't, at least your pot holder will still look good. 3. A clownfish cheese board that'll go over swimmingly at your next get together because everyone will be oohing and awing about how cute it is. Get it from Anthropologie for $48+ (available in small and large). 4. A sleek modern silicone spoon rest every minimalist will want to add to their cart *immediately*. 5. 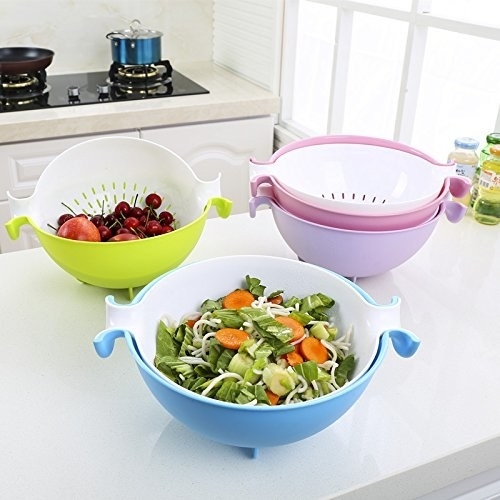 A stoneware bowl with two bamboo salad hands that'll make you want to eat more salads for dinner just so this doesn't have to stay tucked away in your cabinet. 6. A set of stemless goblets – you'll be blushing to send your friends a "Wine and movie night at my place?" text so these glasses can be the center of attention. These are made of glass and should be hand washed. Get a set of four from TJ Maxx for $19.99. 7. A set of unbreakable plates made of wheat straw (so they're degradable and eco-friendly). Plus, they're dishwasher and microwave safe! Get a set of three from Amazon for $18.29. 8. A set of beechwood measuring spoons you'll find are a ~hoot~ every time you take them out to cook with. Get it from Amazon for $11.99 (available in five different designs). 9. A set of pasta bowls because we all know that it really is all about the pasta. Get a set of four from Walmart for $23.52. 10. A stainless steel knife set you'll love a bunch because they're out of this world compared to your current boring knives. No matter what your style is, you have to admit these knives are sharp. 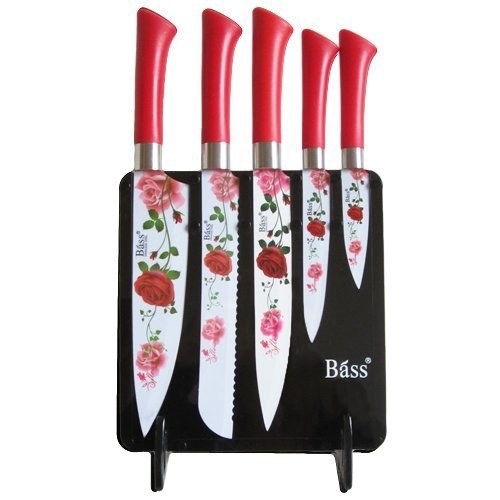 The roses set includes a 8" chef knife, 8" bread knife, 8" carving knife, 5" utility knife, and 3.5" paring knife. Plus, it comes with an acrylic stand to hold all the knives. 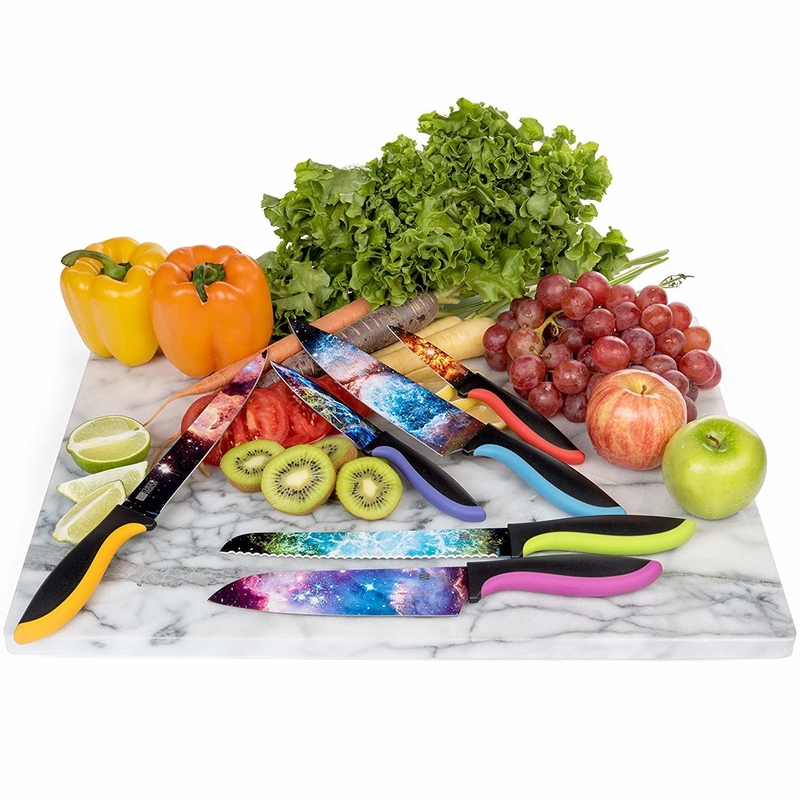 The cosmos set includes six essential knives, including a 3.5” paring knife, 5” utility knife, 7” Santoku knife, 8” slicer knife, 8” bread knife, and an 8” Chef Knife. Get the roses set from Amazon for $24.97 or the cosmos set from Amazon for $49.95. 11. A cake stand to take your baking masterpiece up a notch. Get it from Amazon for $11.77+ (available in eight colors). 12. A snack bowl to fit all your koala-ty snacks in and make that time even more enjoyable. Your daily 3 p.m. snack doesn't even know what's coming. 13. 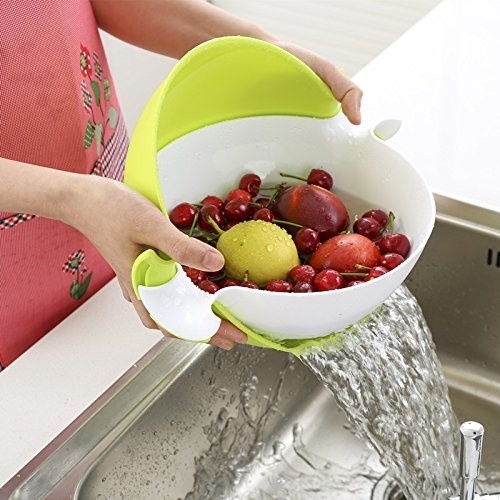 A two-in-one strainer and bowl set that's incredibly functional – all you have to do is tip the bowl to get the water out. Get it from Amazon for $8.59 (available in pink and green). 14. A silverware set to make you feel like you're tasting the rainbow when you eat...without, you know, actually eating the rainbow. Get a 20-piece set from Amazon for $30.99 (available in six colors). 15. A marbled cutting board that's about as beautiful as it is practical. 16. A slotted spoon you'll be in disbe-leaf over. You'll be ~falling~ for this spoon for years to come. 17. Some bamboo utensils that'll be a bright spot in your kitchen. After all, you're allowed to have items that are just nice to look at. Get a set of five from Amazon for $14.93+ (available in five colors). 18. A glitzy cocktail shaker you'll feel super fancy-schmancy using. 19. A cereal bowl set that'll have you cereal-isly reconsidering ever buying plain dishware again. Plus, they're microwave, dishwasher, and oven safe! Get a set of five from Amazon for $37.99. 20. An insulated travel mug that the barista will probably compliment you on when you bring it to your favorite coffee shop to fill. Get it from Amazon for $12.12+ (available in five sizes). 21. A glass storage container to make bringing your lunch to work a little more exciting. Say goodbye to your sad desk lunch! Get it from Anthropologie for $8+ (available in two sizes). 22. A wine decanter you'll feel like you're dining at a five star restaurant every time you use. Also, it will make that cheap bottle you bought seem not as cheap. 23. A set of plastic tumblers to make it ~suc~ less when your party guests accidentally spill a drink because at least with these cuties you won't get glass all over the ground. Get a set of eight from Amazon for $10.99. 24. A non-stick 11-inch fry pan – I can't lie-lac about it, I've been dreaming of adding this my kitchen for a while now. The pan is made of stainless steel/aluminum and id dishwasher safe. Get it from BuzzFeed's Goodful line, exclusively at Macy's for $9.93 (available in lavender, navy, and teal). 25. 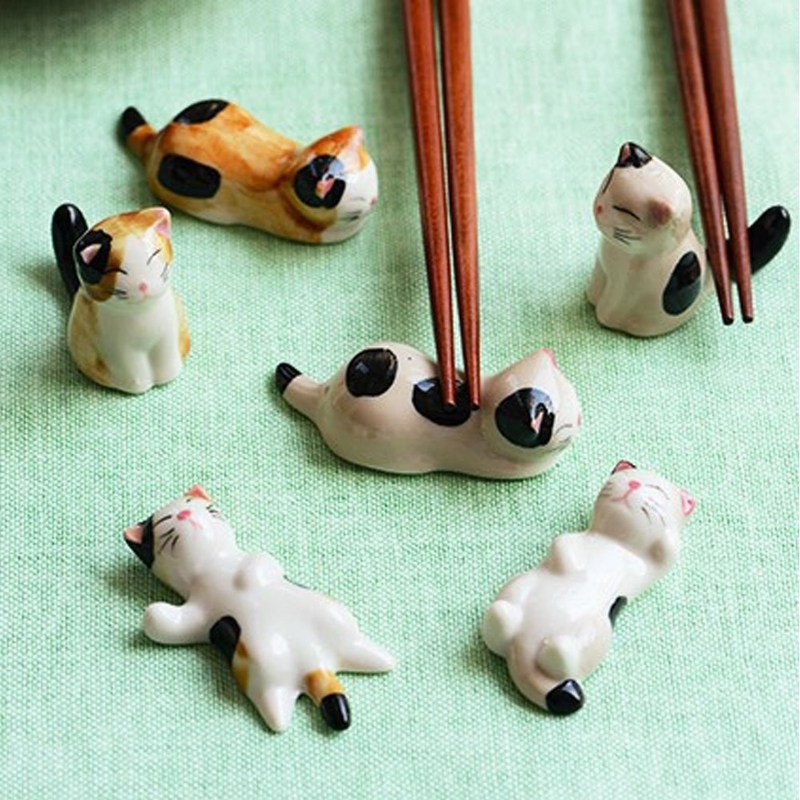 Some chopstick holders you've got to be kitten me about. I mean, come on! Everyone should have these in their kitchen, even if only so they can smile at them every time they see them. 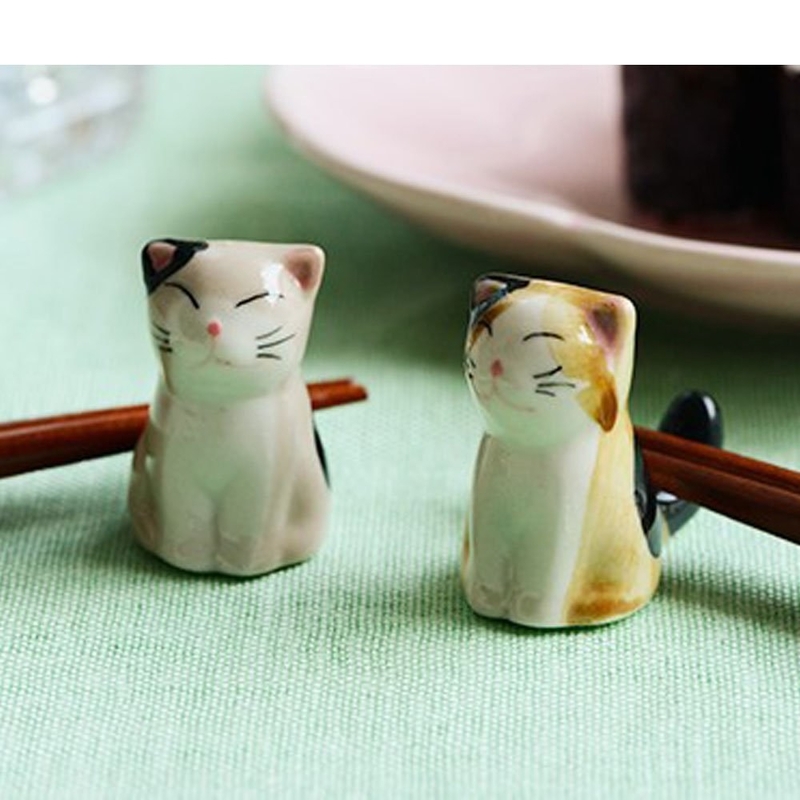 Get a set of six from Amazon for $9.89+ (available in cat and panda). 26. A flower trivet mat meant to protect your tabletop from hot dishes while also acting as super cute wall decor when you're not using it. Get a set of three from Amazon for $11.99 (available in seven colors). 27. A chip and dip plate with a separate area specifically for the dip so you can get the right chip to dip ratio every time. Trust me, this is important. The plate is dishwasher safe. 28. A serving utensil set to impress all your dinner guests with. They might even think you got these from some high-end store. Get it from Amazon for $33.99+ (available in copper and matte black). 29. Some drinking cups that look so nice and fancy, nobody will realize they're plastic! Promising review: "This is my third time ordering these. I have two packs of the little ones and have been so happy with them I decided to get a pack of the larger size. I love them too! They're very sturdy and attractive. I've washed the little ones daily in the dishwasher for over a year now, and they still are bright and shiny with no sign of wear. They're are worth the money!" —Tori Kelley, Ph.D.
Get a set of six from Amazon for $29.95. 30. A stainless steel kettle so sleek and minimalistic, it may inspire you to redo your whole kitchen.